Crenguta Leaua is an experienced arbitrator, acting frequently in arbitrations under the ICC rules or the UNCITRAL Rules. She is also listed as arbitrator by the WIPO list of neutrals for intellectual property disputes and by various institutions in Austria (VIAC), Romania, Bulgaria, Moldova, Poland, Slovenia, Kuala Lumpur, Shanghai and Beijing (CIETAC – both on the list for commercial cases and the list for investment arbitration under Belt & Road). She is a member of the London Court of International Arbitration (LCIA), of the International Council of Commercia Arbitration (ICCA), of the Swiss Arbitration Association ( ASA) and of the International Bar Association (IBA) Arbitration Committee. She is past Vice- President of the ICC International Court of Arbitration and a member of the ICC Commission on Arbitration as well as of a number of its task forces, including the task force on climate change and arbitration and the task force on construction law and arbitration. Since 2017, she is named as Thought Leader in International Arbitration by the Who’s Who Legal. Crenguta also acts as counsel in commercial arbitral proceedings under the ICSID rules, as well as in commercial arbitration under the rules of ICC, WIPO and of other arbitral institution or under UNCITRAL rules. She is a founding partner of “Leaua Damcali Deaconu Paunescu – LDDP” Law firm in Bucharest, Romania, a firm included in top 100 law firms specializing arbitration worldwide (GAR100 – Global Arbitration Review). Her experience in technology- related legal work include: software development (including blockchain technology and cryptocurrency), internet law, intellectual property law (copyrights, trademarks, patents and R&D), aviation law, construction law, energy law, mining ( both mineral resources and oil & gas), environmental law. Examples of notable cases of arbitrations and ADR include a dispute on the development and implementation of the software used by the judiciary system in Romania, a number of disputes on the rehabilitation design and works of the largest hydro-powerplant on Danube river, a dispute on the design of the masterplan for the national integrated transportation system of Romania and a complex dispute of over 4,7 billion USD comprising environmental law issues and state of the art technologies for a gold mine exploitation. She is author or co-author of 5 books and over 50 articles on topics such as international arbitration, intellectual property, construction law, commercial law, corporate law. Crenguta holds a Ph.D. from Bucharest University and has completed an executive education program at Harvard University and a further education program in the field of blockchain and cryptocurrency at the London School of Economics. 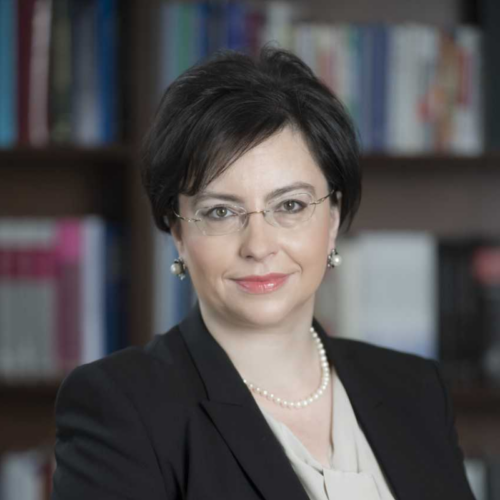 She is a Visiting Associate Professor at the Bucharest University Faculty of Law, teaching International Comparative Arbitration and Construction Arbitration and an Associate Professor of Business Law and EU Law at the Bucharest University of Economics. She was a visiting scholar at Columbia Law School in New York and was invited for lectures on arbitration-related topics by professors or students’ arbitration associations at a number of universities including Science Po, Georgetown University, Columbia University, Washburn University. She is fluent in Romanian, English and French, has a good command of Italian and basic knowledge of German and Spanish.